Back on January 30, 2010 me and Michelle went up to the Hardware Ranch and enjoyed ourselves up there. 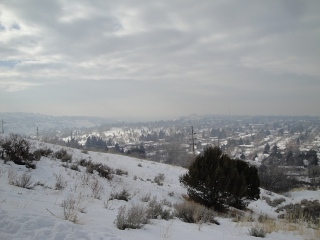 It was foggy and polluted in the valley because of the inversion that sets in during the winter months in Cache valley. It was sunny, beautiful, and warmer. There were also a lot of elk at the ranch. The Hardware Ranch feed the elk so that they won't go into the valley and dammage the agriculture by eating the hay that is supposed to be for the cows. The ranch was purchased in 1945 by the state. Just for you I recorded a video of the trip so that you can see just what sort of elk the mountains have in them. The tour guide is quite helpful in educating about the elk and what is done. Also not all of the elk in the region have come into the ranch at this point. There was a really bad snow pack and so the sleds that would have runners on them had tires instead. The elk moved back into the hills by the end of February because the snow had melted off the south side of the hills and elk are solitary animals. I went on a bike ride up Logan Dry Canyon in January and I made a short little video. The video was recorded on one of the days when there was an inversion in the valley. I'd been up to the gate in the canyon on my bicycle before and been able to get out of the smog before and bask in the warmth of the sun. This was not the case on this day seeing as how the fog was still higher up on the mountain. However I thought the fog looked cool! Cache Valley 1-18-2010All in one day the whole valley has cleared out and is no longer smoggy. It is really nice that there is no smog because of the health effects on living organisms and quality of life. I know that there are many people out there that think that there isn't much we can do but I think that something needs to be done to help reduce pollution. Reducing pollution won't make the inversions go away nor will all of the PM2.5 go away. However man kind is the largest contributor to the dirty air. 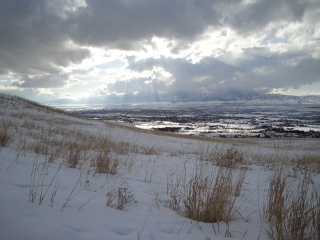 Cache Valley 1-19-2010So one day later a storm comes during the night and warms up the area. On Tuesday the air was warm enough to melt snow for a significant amount of the day. The breeze was blowing from the south and the air was just fresh to smell and felt really good in the lungs. This led to the temptation of going for a bike ride which was done. The bike ride led me to North Logan to as high as a bicycle to be ridden on the bench. The view is quite beautiful in the opinion of Brian. Well I have many more pictures that are worth looking at. The pictures are pretty obvious on which day they were taken.